Charis is now five years old! Since we live in the great sate of Maryland and choose to home school Charis, she is now officially home schooled. Each child who resides in Maryland and is 5 years old or older and under 17 shall attend a public school regularly during the entire school... Maryland recognizes nonpublic schools and home instruction as alternatives to public school enrollment as a means for students to receive regular, thorough instruction. I filled out and submitted the home schooling notification form to the county 20 days before the start of the school year. This is supposed to be submitted "at least 15 days before the beginning of the home instruction program", so yes, I was procrastinating. All summer long, I went back and forth between My Father's World, Sonlight, and Five in a row. I believed that if I did not like the curriculum, I was a failure. Drew reminded me that we are taking school year by year (seeing where we are and examining our-and our children's-strengths and weaknesses) and are open to all options (even public school-I know. You may gasp if you need to.). I finally settled on Five in a Row: Volume 1. This post contains affiliate links. General-Five in a Row: Volume 1 because I liked that it gives you ideas on what to teach your child, but leaves what I want to teach my daughter up to me. I plan on using FIAR to teach my daughter her Science, Art, Social Studies, and Language arts requirement. Math-Singapore Math. This math curriculum was highly recommended by other home school moms at church. So far, my daughter loves it. There's nothing glitzy about Singapore; it's just in black and white, which I like since my daughter's not easily distracted by it. Phonics-Alpha-Phonics. This was not my first choice, but the frugality of this phonics book helped me pick this. It is dry and boring, but my daughter has started to recognize 10-15 words after 4 lessons. So far, the lessons (along with review) take about 15 minutes. I still try to read for fun to my children at least 15-30 minutes each day. Handwriting-A Reason for Handwriting. I only bought the student workbook. I figured I would borrow books from the library and teach Charis a few things about each animal. Let's just say, my daughter needs a lot of practice with her handwriting. Bible-Long Story Short. We received this book as a gift from my parents, and over the summer, I finally cracked it open. I was very impressed with it. Even though it goes over major Old Testament events, the book is saturated with the Gospel and ties in the New Testament at least 1-2 times every week. Spanish-The Complete Book of Starter Spanish. I want my children to be exposed to at least one foreign language in elementary school. Since I took Spanish in high school and Drew majored in Spanish in college and received his Master's in Spanish translation, I decided to go with introducing Charis to Spanish. This is a basic book, with lots of coloring. I go over basic phrases with my daughter everyday. Last week, she learned "rojo" and this week, she's learning "amarillo". If you aren't too sure on pronunciation, I would definitely see about supplementing this book with DVDs or CDs. Do you home school your children? 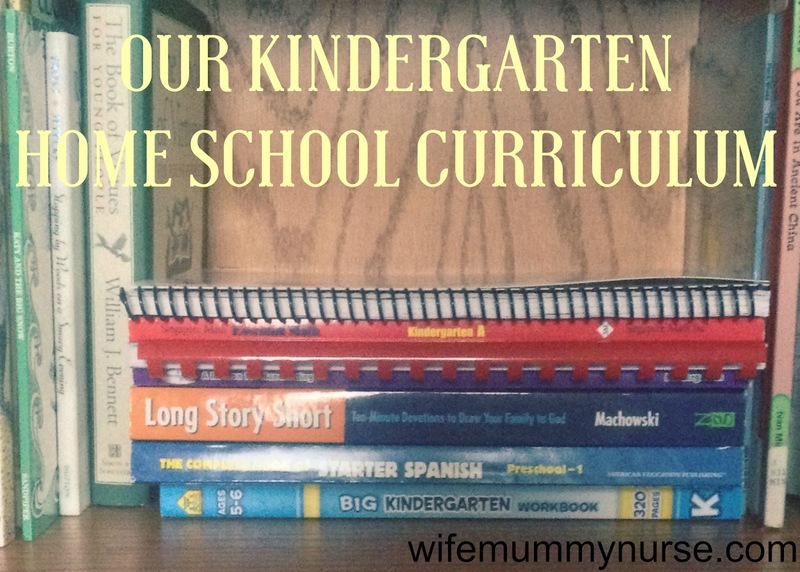 What curriculum are you using this year? Why I Don't Watch "The View"